I'm it! Yes, I've been tagged and it's probably because I'm so slow or couldn't find my shoes fast enough...So, here are 6 of my many quirks, or quarks? 1. I don't know if this is a quirk or a pet peeve, but I hate finding dirty dishes in the sink, especially the side with the garbage disposer. It's like an instant turn off. Whatever romance that in some domesticated female's life may have existed in the chore of doing dishes, for me, instantly dries up on such a sight. By the way, if I were to turn my head to the left by 45 degrees I'd see such a sight, so I guess I just won't look that way, "out of sight, out of mind." 3. I always leave one little bite of food on my plate at the end of a meal. Chris thinks it's cute, but I've wondered what the deeper meaning of it really is. Maybe there is some latent fear of getting lost that leaves me feeling the need to leave bread crumbs wherever I go. Even though I don't actually use them, it just might be the early stages Hanzel & Gretel Syndrome. 5. I can fall asleep almost instantly. All I need to do is lay my head on my pillow and within 5 seconds I'm gone. It's happened in the middle of our evening prayers where I'm the one saying it! It's even happened mid sentence, and yes, while I'm the one talking. Chris will often find himself talking to himself when he thought he had an audience. I have 3 reasons for these narcoleptic behaviors and they are all under the sleep-inducing age of 6. 6. Words. I find that I often use the wrong words, or forms of words in sentences. For me, to use the wrong word is almost as embarrassing as sitting on gum and walking around with it dangling on my backside for all to see (I'm embarrassed a lot). I never noticed this problem until after I started studying a different language, so I guess it's all the fault of my German classes. My most particular hang up is where I mix up the words lay and lie. I always know when I've used the wrong one after I've said it, and sometimes while I'm saying it. This will often result in the creation of a new word like "laaayiii". I've cautiously started using that new word instead of either of the real ones. That way people will just think they have hearing problems and never realize my linguistic challenges. Lacey, Heidi A., Brynn S., Melissa H., Jenn S., and Julie P. you are IT! We were watching the gymnastics Olympic trials the other day and Reed was having a hard time pronouncing and remembering the word gymnastics. Today, while he was watching something, I guess there was an ad for the gymnastics trials, so, knowing how much I like watching them he called out to let me know they were on, "Mommy, the Jurassics are on!" I suppose that's what they would call it if I were competing in the events. "Here comes Tyrannosaurus Becks, ha, ha, did you see that Bob? She can't even reach her arms up to the bar!" This morning we were watching the news and they were doing a story on great White shark attacks on humans in California. Reed and Douglas wanted to know if the people died. One did and the other one just got bit, but survived. This was just a deposit into their brain to be collected and sorted with their other thoughts throughout the day. Later, while driving in the car, of course, we got onto the subject of rats. If I'd been paying attention I'm sure I'd know why, but I wasn't. So, they asked me 1. how big is the biggest rat? 2. Do rats bite? 3. Mommy, are you afraid of rats? 4. How big is the smallest rat? My answers: 1. I was going to say an R.O.U.S., but instead I said "I don't know" 2. Yes, rats bite 3. Yes, because they can bite and they can carry diseases and flees. 4. very small. So this leaves the unanswered question concerning the largest rat. I wish I could find some kind of device to position on my dash board like a GPS but with Wikipedia info instead. It would need to be able to get questions verbally and give them verbally, and preferably in the voice of John Cleese (that is an option on the GPS device for preferred voices, Colin Firth might be kind of fun too). So what we know is that rats bite, can carry diseases, and can be very small. When mommy doesn't know the answers, she starts asking them back, like a psychologist "Doctor Freud, tell me, what do you think about my mother? ", "My dear Sir (ziss iz zo boring, vat iz he talking about, sompsing about his muzehr?) Please, tell me about your muzehr." So, how big do you think the biggest rat is? Reed answered with the exuberance and voice of a boy who has just had an epiphany. "It's so big that it's called The Great White Rat!" Of course! They bite, they're big, they scare mommy, what else could it be? This must mean the biggest rat is probably as big as a great white shark. Maybe they do know about R.O.U.S. 's after all. I got the chess board out of the closet and the boys have been enjoying some early morning brain stimulation. Once he light sabered his brothers game (they were pretty much done, luckily), Isaac gave the game a go. Strawberries…what a delectably juicy and delicious fruit! The very smell of strawberries (and watermelon) creates instant memories of summertime and picnicking. On Friday, which happened to be the first day of summer, the boys and I went strawberry picking with some friends. After about an hour of picking we gathered 8.5 lbs of strawberries. By that time my back was killing, my fingers were dyed red, Isaac had squished several plants, berries included, the minors had all consumed a plethora of their pickings (how do you pay for those? ), and Reed was ticked off at the plants that were poking his legs. See the result of our hard work! If you come over you may taste it too! 15 jars of strawberry jam!!! I feel so domesticated, even pioneer womanish! "It takes a village..."...to get your refrigerator repaired. We live in a quaint 1968 Colonial style townhouse community called The Village. Whenever we need to get something fixed or pay our monthly fees we will refer to those repairmen or management as "The Village People." For some reason, perhaps the reference to a late 1970's music group that sings about the YMCA, I have never been that comfortable with that title for our community helpers. The YMCA is actually a place where I exercise on rare occasions and take the boys to their swimming lessons, but we never sing about it on our way over. In fact, I would much prefer "Are We There Yet?" by Elmo. My clever boy Reed has a talent for naming things how they should be named. He calls hotels "hotellos", it has a much more romantic sound to it, Italian in a way. He calls people who are not Kindergartners "graders," a much simpler term than I've ever heard. Now my favorite, and the solution to my "Village People" dilemma, is that he refers to those community helpers as "The Villagers." Brilliant! So , now we too call them, the Villagers. "The Villagers are coming over to fix the drain." "The Villagers are coming over to repair the refrigerator." "The Villagers are coming over with their pitchforks and angry faces to run us out of the village for leaving our window open when it was 39 degrees outside! Oops." Maybe it's time to find a "hotello!" That word 'confabulation' is a great word! The twisted mind that I have instantly thought of a word that sounded kind of like it, but started with 'flat'. Its definition comes nowhere near the gutter my mind fell into upon this verbal introduction. It quite innocently means: to converse informally, chat. I guess it's a psychiatry term and is used like so: "to engage in confabulation." Still, I don't think I could keep a strait face and properly balance on the doctor's couch if he were to ask me to sit still and confabulate with him. Anyway, my mom, grandma Poet, and aunt Jodi all came for a quick visit on their way to Prince Edward Island/Anne of Green Gables land (Where's Gilbert?). We had some very serious and some very not so serious moments of confabulation. I wonder if conblabulate would be a more accurate word for conversing informally. I wish English gave genders to its nouns because I bet a conblabulation would be feminine. I'm confabulating way too much in this blog, blah, blah, blah, "yes doctor, I am listening and I do want to confabu...ha ha ha ha ha!" My blooming delphinium and my little digger. I think I could put him to use in my garden. I just need to redirect his lofty interest in beheading my favorite flowers and lower it to a subterranean level where weeds grow and snails preside. Isaac looking for more rocks. I have the feeling most of them are at the bottom of this lake. This morning I was observing as Chris was looking for a tie to go with his pants. I congratulated him on his choice of tie and told him they went well together. He said, "look I matched the blue in the tie with my blue pants." He was surprised when I told him that his pants were black and that the color in his tie which he thought was blue, was really gray. We both were correct in his ability to dress himself, but if the women at work were to compliment him on his nice black pants and yellow and gray tie, he would be quite confused. "The most common form of color blindness is inherited. However color blindness can also be caused by diseases such as macular degeneration, poisoning and side effects of medication. Women are usually the 'carriers' of the defect which is passed on through a defective x chromosome. It is mostly men who inherit color blindness, affecting about 1 in 20 men for every 1 in 200 women." According to this article it's partially women's fault when their helpmeet comes out dressed in navy blue pants, black socks, brown loafers, a red shirt and a purple plaid tie. So, in the end, we, the bearers of the "x" are to blame for male color blindness, which should encourage a little more patience with their error in the color department. Chris thinks women see more colors in general then do men. I'd have to agree with him. The greatest difficulty mostly comes where the colors are transitioning to another color on the wheel. The black to dark blue, dark blue to purple. After this fashion faux pas we had a conversation where we talked about my dark purple shirt that he thought was blue and came to an agreement by renaming that color between blue and purple, "burple." Maybe we could patent that color, for weirder things have been done. Can you see where "burple" would be? I was curious if anyone actually had patented a color, but I couldn't find one but here's an example of a totally absurd patent, just so you know "burple" really could patented. "Is the problem of trying to collect and measure gas emissions from livestock (or maybe your in-laws) keeping you awake at nights? Have you ever wondered exactly how much energy cow burps emit? Now your curiosity can be satisfied with the 1993 patent of the 'System for Measuring Metabolic Gas Emissions From Animals"! Designed to measure how much energy free-roaming livestock actually use, this device will help identify the feeding systems which allow the most efficient use of energy for the health of the cow. Dressing your husband can also be fun, maybe not as fun as that inflatable collar. But like this invention, it just takes another level of gas and creativity. I can learn to help with gentle hints like "I think there's a stain on that tie, let me go get you a different one." Today, my charitable heart was tempted to get a Sharpie and write the color of his pants on the inside tag, "blue", "black", "gray", "burple." He might be insulted at first, but in the end he'll thank me...I hope. Mommy, what killed the dinosaurs? This morning after my walk in the liquid air that surrounds our dry fish bowl, I was not feeling very good at all. I was achy all over and I didn't even exert myself all that much, "baby steps" around the block. Because I don't take illnesses gracefully, I complained. The thing is, I rarely get sick and the majority of my "sickness" only happens once a month, and a hefty dose of Motrin saves the day (well that, a diet coke and chocolate). Reed, upon hearing me complain, tried to empathize and told me "I think I'm going extinct." Well, maybe that's what's happening to me. Reed has a very impressive vocabulary and his usage is usually pretty close. In this case, he nailed the word right on the head. The global conditions that are causing our extinction today include: an increase in humidity, a substance that the Russians call "Pookh" (some white tree stuff that's been flying around giving the appearance of snow and making me sneeze my head off), the fact that the sun keeps rising so early in the morning interrupting my sleep, Isaac's screams, Douglas' eternal list of unanswerable questions, and the secret invisible mind-melting laser beams that quietly shoot out of my computer and into my brain while I type. I'm sure these conditions are ploys all set up by some top secret environmental organization set on decreasing the population and handing earth back over to amoebas. Some people have actually been tainted by exposure to the movie "Soylent Green" and believe that man will eventually be turned into food if we keep repopulating the planet. So, whichever of these things cause my extinction I'd like you all to know that my favorite flowers are currently roses, I want a coffin made of chocolate, and be sure that there is no "pookh" locked in there with me. You can also put a cold diet coke, preferably fountain, in my hand and be sure to bury me under my bed and check on me later to make sure I'm really extinct. (No, I'm not on drugs, well just one, but it's helping with the achiness). Douglas asking "how big is the biggest Chihuahua?" Isaac being a cheezer for the camera, as usual. Lately, I've noticed as the boys have gotten taller and their heads have started to reach the height of my hips, that my girth has gotten wider. Reed just walked by me through a doorway this morning and I thought we could both pass unscathed, but the poor boy got knocked in the head by this seemingly ever increasing section of my body. I apologized but he didn't seem to notice the head jarring, almost like it's a frequent occurrence, and went on in his intended direction, hmm. This is a problem. For the last7 years of my life, the only time I've gotten a full glance of the direction my post child bearing body has taken, has been in the reflection of a glass door or in a dressing room mirror. I didn't really know what my hips were doing, for as far as my reflection went all that existed of me was from my waist up. Small bathroom mirrors, I believe, could be one of the culprits in unchecked weight gain. I guess there could be other reasons that have lead to this problem, for instance the fact that I'm having a slice of my birthday cake for breakfast, naaahhh, that couldn't be it. Definitely a lack of a full length mirror is to blame. It was my 32nd I mean 23rd birthday yesterday and our very nice friend, Chris Rogers, watched our boys while Chris and I went out on a date to dinner and a movie (date: [deyt] "is when you pretend you don't have children" from Douglas' Dictionary) . We tried out a new restaurant called Smokey Bones. As we sat eating some very messy ribs and were "pretending we didn't have children" we recalled the night we took the boys to TGIFridays and Douglas, after daringly trying ribs for the first time, asked "Who's ribs are these?" This question set the lone and rather stoic looking business man sitting near us into a state of laughter. We assured Douglas that they didn't belong to anybody we knew. After dinner we decided to go watch Narnia: Prince Caspian again which was like seeing it for the first time as the last time we saw it was with the boys. That first time we didn't realize how long of a movie it would be and half way through the timer on Isaac's attention span went off. So, besides walking around and hopping up the theater's carpeted steps, he would wait for the quiet spots with quiet dialog to express his 2 syllabled statement of "rib-it", repeated over and over again. Needless to say, we got so much more out of the movie this time and found out how it ended and there were no frogs saying "rib-it." How is a person to enforce good manners when bad manners are so funny? The boys were just laughing and making a song about wedgies to the tune of Old MacDonald. Instead of a "moo-moo- here and a moo-moo there", the words were "and a Stinker Sound Made With Mouth Sounds here (SSMWMS - not to be mistaken with WMD's)) and an SSMWMS there…" I made the mistake of saying, "Please don't talk about that, it's not very funny" and then they started laughing. I'm obviously wrong, it must be pretty funny or they wouldn't be laughing. Maybe the That-isn't-very-funny clause should be taken out of the Teaching Manners guide (which I didn't get, I'm just going on memory). Really, some of the gross things boys think are funny really can be funny. This is Kermit the Frog interviewing Old MacDonald concerning the new lyrics to his famous tune. He does not look happy, nor is he laughing. See, I was right, it wasn't funny! We went to the temple in Detroit today and took the boys who would be watched by some nice people in the ward while we attended a session. We of course were running late and had to stop at our local McDonald's for breakfast. Unfortunately, I am known at this McDonald's and the "order lady" and I know each other's first names. It really helps that we are both named Becky. She asked what we were doing today and in order not to have to explain in 30 seconds what going to the temple is, I said we were going to a "church thing." Well, we did our church thing, came home to super hot humid weather and sent the boys from the car straight to the sprinklers. After an hour of sprinkler and inflatable pool time, the boys were ready to come in. Isaac knew he was ready for a diaper change (the kid is afraid of sitting on the toilet, help. ), but to our dismay he was past ready and with Chris carrying his arms and me carrying his feet to avoid spilling the diaper contents, we hauled him up for a bath. A parent such as myself cannot do this in a quiet accepting manner. My voice must express what my nose cannot. Somehow it makes it better to weep and wail while trying one's best to not be touched by the multi colored ickiness found in and out of his diaper. Well, we survived and after three "out [darned] spot" hand washings, the smell has almost dissipated. The cleansing of Isaac brings us back to the new rendition of "Old Macdonald" performed by the Williams Brothers, live in the room next door. For enduring these experiences and many more like it to come I've been blessed with an understanding of "boy humor" and a large supply of anti-bacterial sanitary (and sanity) wipes. Peonies, how do you say that word? I took a few pictures of our neighbor's peonies as mine haven't bloomed yet. I hope he didn't mind, but he has the nicest boarder of them along his house. He seems pretty nice and just a little bit weird. I actually don't think I'd mind being described that way by someone, beats other descriptions of personalities I've heard. He's about 60 and lives with his mother and spends almost everyday of the summer sunbathing in his speedo for all of his neighbors to see. Hasn't he heard of skin cancer? He's a little to old to use the excuse of curing a bit of jaundice with the sun. Whatever his reason, go does grow some beautiful flowers for which I'm grateful. I took this picture of Isaac on the playground near the flowers. I never thought it would be possible to live in a city of about 119,000 people and know who the slowest driver in the city was and see him at least once a month living up to his title. I know he is the slowest, not only from my observations, but because there are others including Chris, who have also seen him. He is the Loch Ness monster of Lansing but you have to be going at least 5 miles below the speed limit in a 30 mile an hour zone or you'll never see him. Those who go any faster will only see a blue blur and perhaps a hand with a particular finger extended blocking your view. He drives a Ford Crown Victoria which is the same car used by the police department. He even has all the extra antennae that a cop would have, but with a plethora of stickers. I'm surprised I don't have them memorized as one would have plenty of safe reading time going his preferred speed. If he were to drive up behind you in that dark blue color you'd swear you were being pursued, except for the fact that he's probably never been at a "pursuing" speed in his entire life and wouldn't be able to maintain the actual speed to get that close. I think he thinks of himself as the speed regulator of the city. We live off a road called Miller which has a 30 mph speed limit. It's very difficult and even trying on my ankle to go that slow. I've had to use the cruise control in order to keep in the limit. A couple of months ago I got caught behind him on the complete opposite side of town from us in a 45 mph zone and he was going 30mph. If I were to change lanes I'd be behind a lady who looked like she was 90 years old, who could hardly see above the steering wheel and was driving a Subaru station wagon. I changed lanes and watched in awe as she passed this guy with ease. She probably felt a little nervous thinking she was going above the speed limit and I could picture her looking up and down at the speedometer verifying her speed while she timidly passed him. Out of great respect, and completely out of character, I continued to follow her, still 5 miles below the speed limit, to give her the support and reverence old ladies never get on the road. The following is about 3 minutes of conversation on our way home from school. Just an average session with Dr. Minivan. I'm sure I'd understand the root of these conversations if I wasn't paying attention to the road while driving. Reed: Construction workers work the hardest. Mom: Well, I don't know about that. I think firemen, policemen, and soldiers work pretty hard too. (in the back of my mind I'm thinking that weird guy who works for that Discover channel 'Dirty Jobs' works the hardest of all, or at least is the most insane. Actually that Man vs. Wild guy works pretty hard too). Reed: But who works the hardest? Mom: Maybe soldiers because they have to be really strong and brave so they can fight the bad guys. 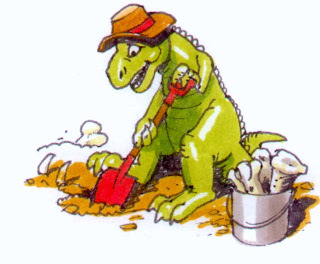 Douglas: I think paleontologists work the hardest because they have to dig for dinosaurs all day. Reed: If someone jumped off that pole would they die? (he has lost interest in the worker subject). Isaac: Ha-ha-ha-ha-ha...(Reed's making Isaac laugh by letting him put his hand over his mouth, I really don't get why that's funny, but obviously it is at some level of maturity). Mom: I think soldiers still work harder because the people they are fighting are still alive. The dinosaurs are dead and don't move when they are digging for them. Douglas: Oh ya? Well, I think if the dinosaurs were alive that being a paleontologist would be the hardest job in the world! Mom: You know, I think you're right. Douglas: Why is it raining? Aroma de feet that haven't been wearing socks while wearing shoes. Reed came home early from school today due to a stomach ache which was quickly remedied after a trip to the water closet. This was Isaac's attempt at breakfast. In order to get him to eat his blueberry muffin I have to call it a cup cake. But, as with cup cakes, the top is all that is ever eaten because that's where the frosting ends. Smiles and a major laughing fit! This is another video from my cousin Jayme. Where does she get these things? They certainly keep me crackin' up and some days I really need it. Talk about an addictive laugh! Enjoy!